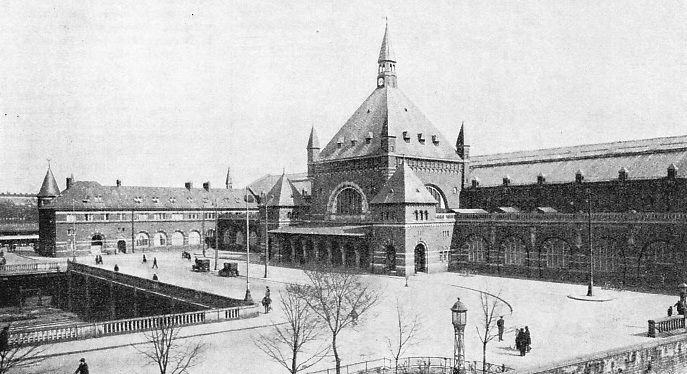 THE MAIN STATION at Copenhagen in East Denmark. This is an important through station for traffic to the Scandinavian countries. A railway journey from Copenhagen to any foreign country necessarily involves crossing the sea, and the Danish railways operate several ferry services. IT would be difficult to find a country more awkward than Denmark from the railway operation point of view. Reference to the map shows that this part of Scandinavia is geographically disunited. Its chief constituent is the lengthy and comp-aratively narrow peninsula of Jutland, pointing northwards from its junction with Western Germany. Well to the east of Jutland, and just off the south coast of Sweden, is the large island of Zealand. Various smaller islands, of which the principal is Funen, lie between Jutland and Zealand, and fill up the Kattegat, which forms the entrance to the Baltic Sea. Furthermore, the capital, Copenhagen, is at the extreme eastern edge of the easternmost island, Zealand. In whatever direction, therefore, the railway passenger desires to travel from Copenhagen, waterways appear before many miles have been traversed. A water crossing is necessary from Copenhagen to reach any country other than Denmark and, save for the transit to Sweden or Norway, which takes the traveller only once across the water, all journeys from the Danish capital to other countries were, until 1935, broken twice by waterways before the frontier could be passed. To do away with the constant transhipment of passengers and freight, the Railway Administration of Denmark has develop-ed the principle of the train-ferry to a remarkable degree. The train-ferry carries the railway coaches and wagons bodily across from one side of the water to the other, and thus saves a great deal of trouble and inconvenience. These ferries are dealt with in detail in the chapter entitled “Train Ferries”, which begins on page 291; but brief further reference is necessary to the train-ferries of Denmark, to complete the survey of the subject. However short may be the distance to be traversed, and however efficient the working of a train-ferry, it is bound to delay considerably all train services passing over it. Most trains must be broken up and marshalled into short formations before they can be accommodated on the limited length of the ferry steamer’s deck. Moving the vehicles on and off must be done slowly and carefully, and the speed on water is but a fraction of that maintained by the train on land. Moreover, a consider-able number of ferry-boats, with their crews, is required if anything approaching a frequent railway service is to be worked. The obstacle of two train-ferries in one single main route is better imagined than described; yet this was, until quite recently, the condition of affairs in Denmark on the most important of all its main routes. This is the one connecting the capital, Copenhagen, with the mainland province of Jutland. Not only does Jutland contain the important cities of Aarhus and Aalborg, but also, on its western side, is the port of Esbjerg, which is the terminal of the chief steamship service connecting Denmark with England. Through services operate also between Copenhagen and Paris by way of Schleswig and Hamburg. STANDARD GAUGE RAILWAYS have been laid throughout Denmark, and there are about 3,250 miles of track in the country. The State Railways control some 1,560 miles of line. The first railway in Denmark was built as far back as 1847. After leaving Copenhagen, the Jutland main line travels across Zealand for sixty-eight and a half miles to Korsor, and then finds the Great Belt, sixteen miles wide, athwart its path. For reasons just given, this sixteen-miles crossing to the town of Nyborg, on the island of Funen, consumes an average of an hour and a half, including the time spent at the ferry terminals on either side. From Nyborg there was formerly a run of fifty miles across Funen to Strib, where once again a waterway - the Little Belt - had to be negotiated. This is only a mile in width, but at least three-quarters of an hour was added to all through journeys by the necessity of ferrying the trains across from Strib to Fredericia, in Jutland. But now the Little Belt train-ferry no longer exists. It was a great day in the history, not merely of the Danish State Rail-ways, but also in that of Denmark herself, when, on May 14, 1935, King Christian in person opened the great bridge which has been thrown across this waterway. As far back as 1885 the first measurements had been taken across the bed of the Little Belt in the hope that bridging might be ultimately possible, but it was not until 1924 that the decision was reached to embark on this costly undertaking. The original estimated cost was 18,500,000 kroner (about £826,000, with the krone at 22.40 to the £), but when the work of construction was finally sanctioned in 1927, it was realized that, in view of the widespread development of motor traffic, it would be essential to accommodate a roadway as well as a railway on the new structure. And so the final expend-iture on the bridge has totalled 24,600,000 kroner (about £1,098,200). With the new road and rail approaches, and the large new station and marshalling yards that have been laid out at Fredericia - the important junction on the Jutland side of the bridge - it is calculated that the total cost to Denmark has been no less than 40,000,000 kroner, or about £1,785,000. The execution of the project was entrusted to the Danish firm of Monberg & Thorsen, which began work in 1929 by tipping the material for the enormous embankments which form the approaches to the bridge on either side. These approaches were completed by the construction of eight immense reinforced concrete arches - the largest in Denmark - four on the Jutland and three on the Funen side. But it is the central portion of the bridge which commands the most attention. Between the extremities of the ferro-concrete approach viaducts a distance of 2,707 ft had to be bridged. At its maximum, the intervening channel is 133 ft deep, and has a strong current, while ice has to be reckoned with in winter. 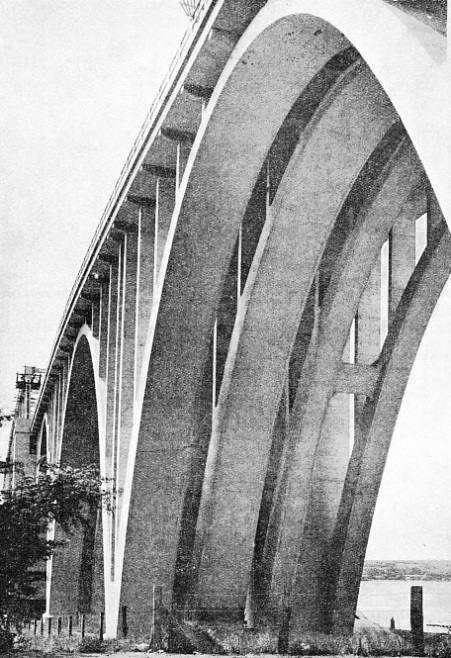 For economy in steelwork, it was decided to adopt a continuous cantilever design, with girder-work balanced about the supporting piers, and hinged at the points of junction in the centre of each span. By this means it has been possible to bridge the deepest part of the channel with one clear span 722 ft across. This is flanked by two 541-ft spans, one on either side; the two outside spans are each 451 ft across, making five openings in all. At the four piers the depth of water varies from 98 to 131 ft, but the depth to which the two centre piers were sunk below the sea-bed brings their total height up to 240 ft each. The work of building the four piers was one requiring great skill, and attracted world-wide attention. Reinforced concrete caissons were first built on shore, and were then launched, in the manner of ships, from slipways. As they had to be located on an underwater foundation that was sloping or uneven, it was necessary to build and launch them upside down, tow each one to the site, and capsize it while afloat - a delicate operation which was watched by thousands of spectators. By a new process, which involved the use of a ring of concrete tubes round each caisson, the caissons were successfully lowered on to their position on the sea-bed. Through these tubes was carried out the excavation necessary to enable each caisson to sink to its proper position, under its own weight and that of the added ballast. Then came the sealing of each caisson with concrete, after which it was possible to build up the superstructure of each pier to girder level. 108 ft. above water level. The bridge cost over £1,000,000. Next followed the task of erecting the steelwork. As is usual with cantilever structures, building proceeded from each pier outwards, thus utilizing to the full the principle of balance, until the girders met at the halfway point between each pair of piers. The maximum depth of the girders, at the centre of the bridge, is 80 ft. At high tide the middle span has a clearance of 108 ft above water level, so that there is no interference with navigation. The bridge carries a double line of standard gauge railway track, a roadway 20 ft wide, and a footway 6 ft 6-in wide. Including both the cantilever section and the ferro-concrete approach arches, the structure has a total length of 3,865 ft. The new bridge is about three miles distant from the old train-ferry, along the course of the Little Belt, which here winds considerably. Its location was chosen to take advantage of the narrowing of the channel, which reduced the gap to be bridged. A considerable length of new track was needed, and also new stations at Middelfart, on the Funen side, and at Fredericia, on the mainland. The old station and ferry terminal at Strib are not now in use. A handsome and commodious station has been built at Fredericia, which is a junction of considerable importance: it has four island platforms, serving eight through lines, and the central portion is roofed across. 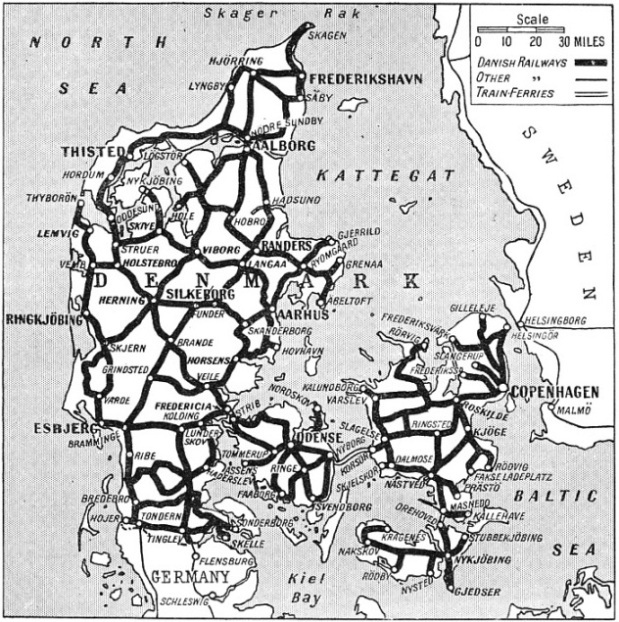 From Fredericia the main lines of Jutland spread out fanwise - northwards to Aarhus, Randers, Aalborg, and Frederikshavn; north-westwards to Viborg and Struer; westwards to Esbjerg; and southwards to Padborg and Germany. Trains for the Esbjerg and Padborg directions, which use the same tracks as far as Lunderskov, have to reverse their direction of running in Fredericia, as the junction with the Aarhus line is trailing. Flying junctions have been laid in, to facilitate the traffic working, together with the latest type of electric light signalling. But the Danish State Railways were not merely content to cut from their train schedules between Copenhagen and Jutland merely the time previously occupied in ferrying across the Little Belt. Simultaneously with the opening of the new bridge, a revision of the timetables of so drastic a character was undertaken that an aggregate cut of 2,200 minutes was made at one stroke in Danish train-times. Not only so, but some new trains were introduced, with Diesel-electric propulsion, timed at speeds hitherto unknown in Denmark. These new services are known as Lyntog, or “Lightning Trains”. Each train consists of three cars, handsomely finished in red with two narrow white horizontal bands below the windows, thus making the Lyntog readily distinguishable from all other trains. Power for each train is provided by four 275-hp Diesel engines, two at either end, driving dynamos; these, in their turn, produce the electric current by which the trains are driven. The 1,100 hp of each set is sufficient to maintain, if necessary, a speed of eighty to eighty-seven miles an hour, which has been reached on test; but for the present the Lyntog are limited to a maximum speed of seventy-five miles an hour. Accommodation is provided in each Lyntog for 168 passengers. The two outer cars seat “general” class passengers in large open compartments, with tables. In the middle car there are both first-class and “general” class compartments. It should here be explained that, some years ago, Denmark abandoned second-class and third-class in favour of one “general” class, and does not now distinctively mark such compartments with numerals; the only compartments carrying distinctive exter-nal markings in Denmark are first-class, which are confined to the through International trains, the Lyntog, and certain suburban services round Copenhagen. In the Lyntog space is also found for restaurant and bar accommodation on a limited scale. 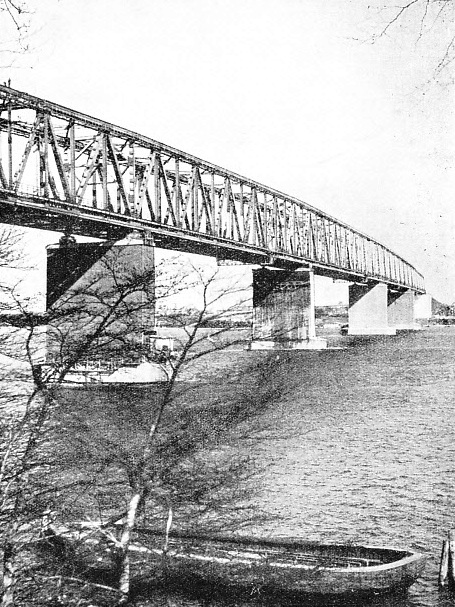 As illustrating the combined effect of the Little Belt Bridge and the introduction of the Lyntog, the quickest time between Copenhagen and Esbjerg, 193¾ miles, which up till April, 1935, was seven hours, has been cut at one stroke to four hours forty-five minutes on the “Vestjyden” service, which runs in connexion with the Esbjerg-Harwich steamer. So far as concerns England, whereas previously the passenger for Copenhagen left Liverpool Street Station, London, at 7.42 in the evening, and reached Copenhagen at 7.40 in the morning on the second day after departure (a journey of thirty-six hours), he now leaves London at 4.10 pm (or 3.10 in winter), and is in the Danish capital just before midnight the next evening, the present journey taking thirty-one and three-quarter hours. SYMBOLIZING STRENGTH. The Little Belt Bridge has one centre span 722 ft long, flanked by two 541 ft spans and two outside spans of 451 ft. Including the massive ferro-concrete approach arches - an unusual view of one of these is shown above - the structure is 3,865 ft long. This Danish bridge carries a double line of standard gauge track and also a road and a footway. Another of the Lyntog is named “Kronjyden”, and turns northward, after crossing the Little Belt Bridge, to Aarhus and Aalborg. Leaving Copenhagen at eight o’clock in the morning, it includes in its schedule the first run exceeding one hundred miles in length between stops that has ever yet been known in Denmark - from Nyborg train-ferry terminal over the bridge to Aarhus, a distance of 123 miles. This is covered in 126 minutes, at an average speed of 58.6 miles an hour, and in the reverse direction in 124 minutes, at 59.5 miles an hour. By this means the best Copenhagen-Aarhus time of seven hours seventeen minutes has been reduced to four hours thirty-six minutes. The 294 miles from Copenhagen to Aalborg are covered in six hours twenty-five minutes, including, roughly, ninety minutes spent on the Korsor-Nyborg ferry crossing, and Aalborg is reached at 2.25 pm; “Vestjyden” then starts back at 5.5 pm, and reaches the capital at 11.45 pm - “Ostjyden”, the third of the Lyntog, runs over the same route, but makes more stops; incidentally, the last-mentioned makes the fastest booked run in Denmark, from Roskilde in Zealand to Slagelse, 38¼ miles in 38 minutes, at 60.4 miles an hour from start to stop. Until 1930, only just over a thousand miles of daily train journeys in Denmark were booked to be covered at forty miles an hour or over. To-day that figure has been more than quadrupled, and 1,240 miles of Danish travel are daily booked at over fifty miles an hour. These are big achievements for a small country. International connexions have also been improved. Two hours have been cut from the journey between Copenhagen and Hamburg. Furthermore, the through daily sleeping car of pre-war days. between Paris and Copenhagen has been restored, making the journey in exactly twenty four hours. It travels with the famous “Nord Express” between Paris, Liege, and Cologne, and thence via Hamburg. Next in importance of the Danish main lines is the one travelling southwards from Copenhagen to Gjedser, using the same tracks as the Jutland trains as far as Roskilde. Gjedser is the ferry terminal tor the direct service to Warnemunde, in Germany, by which through coaches and sleeping cars are run between Copenhagen and Berlin. This route offers another example of a short and a long ferry crossing. While the Gjedser-Warnemunde passage is forty miles in length, Gjedser itself is situated on an island adjacent to Zealand, the two being separated by the Storstrom, a waterway a little over two miles wide. Following the successful completion of the Little Belt Bridge, therefore, the even greater task of bridging the Storstrom has now begun. This bridge, 10,850 ft (2 miles 290 ft) in length, will be the longest in Europe, beating the Tay Bridge by 71 ft. It is also of interest to British readers to know that the British firm of Dorman, Long & Co, Ltd, whose achievement in carrying to a successful completion the gigantic steel arch over Sydney Harbour, New South Wales, is fully described in the chapter beginning on page 1195, have been entrusted by the Danish Government with the task of building the Storstrom Bridge. The class of steel to be employed is of the quality known as “Chromador” which, with a certain percentage of both chrom-ium and copper in its composition, has exceptional corrosion-resisting properties. Its use makes possible a reduction in the cross-sectional area of the various members of the bridge, which in its turn reduces the weight of steelwork, and has an important influence on the design of the structure. AN EXPRESS LOCOMOTIVE built for the Danish State Railways in 1921. This 4-6-0 engine has cylinders 18¼-in by 26½-in, and the diameter of the driving wheels is 6 ft 1½-in. The tender has a large carrying capacity and runs on eight wheels. Some of the fastest steam trains running in Denmark are made on the service between Copenhagen and Gjedser. From Masnedo - the northern ferry terminal on the Storstrom - to Copenhagen the run of eighty-one miles is made without a stop in 104 minutes. Completion of the Storstrom Bridge, from Masnedo to Orehoved, will probably reduce the Copenhagen-Gjedser journey by at least an hour, and will bring to an end a second train-ferry service. But five such services will still of necessity remain in operation. In addition to that across the Great Belt, and the crossing between Gjedser and Warnemunde, which is operated jointly with the German State Railways, there is the crossing from the port at Copenhagen to Malmo in Sweden, worked jointly with the Swedish State Railways. Another ferry runs from Helsingor - the Elsinore of Hamlet - to Helsingborg, in Sweden; it crosses the narrowest stretch of the strait separating Zealand from Sweden. Finally, a privately-operated ferry crosses the Oddesund, in Western Denmark, and connects Struer with Thisted. Denmark owns in all about 3,250 miles of line, of which barely one-half (1,560 miles) is comprised within the system of the Danish State Railways. The remaining half of the mileage belongs to small private concerns, and their relative importance may be measured by the fact that the State lines take more than eighty per cent of the total traffic receipts in the country. Danish railway history began in 1846 with the line from Altona to Kiel, but this was lost after the war of 1864, which resulted in Prussia’s seizure of Schleswig-Holstein. The oldest piece of line in Denmark to-day forms a part of the main line between Copenhagen and Jutland; it is the section from Copenhagen to Roskilde, and was opened on June 27, 1847. Nearly all the early Danish railways were built by British engineers, and it was not until 1871 that the Danes seriously set out to make their own railways. Many of the early locomotives were British also, and some of them have paid a notable tribute to British workmanship by remaining in service for over sixty years continuously. In 1862 the firm of Robert Stephenson built twenty-four locomotives for the opening of the line from Aarhus to Randers. It was not until 1935 that the last of these were being withdrawn from service. One veteran, which, it is computed, has travelled 1,149,590 miles during her lengthy career, is to be preserved in the Danish Railway Museum. Since these earlier days the majority of the Danish engines have been supplied by German firms, but locomotive-building is now a well-established industry in Denmark, and locomotive importations are no longer necessary. BUILT IN GERMANY for the Danish State Railways in 1923 by the Borsig Company, this 2-8-0 goods locomotive has cylinders 18¼-in by 26½-in; diameter of the coupled wheels is 4 ft 6½-in, and the weight of the engine in working order is 77 tons. Locomotives of the Danish State Railways may be readily distinguished by the fact of their wearing the national colours - a red-and-white band - round the base of the chimney. They include various modern types, of which the most powerful are some large 4-6-0 passenger and 2-8-0 freight engines built in 1921 by the German firm of Borsig. Both types have cylinders 18¼-in diameter by 26½-in stroke; the 4-6-0 has driving wheels 6 ft 1½-in diameter, and the 2-8-0, 4 ft 6½-in. diameter; the former weighs 78 tons, and the latter 77 tons in working order without the eight-wheeled tender, which adds another 48 tons. 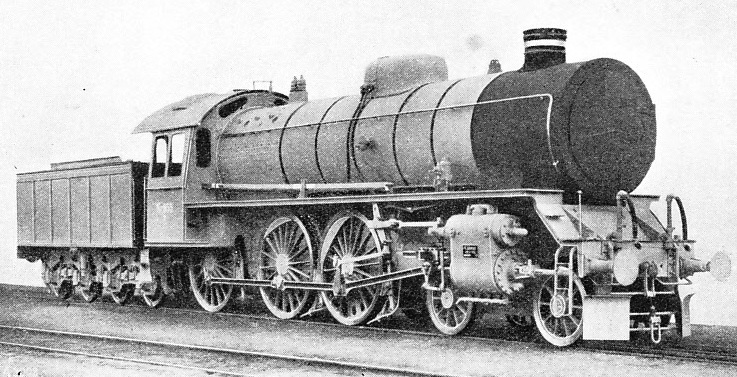 There are also some fine Danish-built express tank locomotives of the 2-6-4 type, built by the firm of Frichs, of Aarhus; these have cylinders 17-in by 26½-in, and driving wheels of 5 ft 8-in diameter. one State-owned engine-sheds is that at Copenhagen, which accommodates one hundred locomotives. Extensive trials have been made with internal combustion locomotives, and Diesel-electric and petrol-electric rail-cars have come widely into use, so that more effective competition with road transport may be possible on the railways. In addition, the progressive management of the Danish State Railways has lately electrified the suburban railways round Copenhagen; the reward of this enterprise has been an enormous increase in the traffic carried over these routes. The practice of earlier days has been reverted to by coming to Great Britain for the electrical equipment, which has been supplied by the English Electric Co, Ltd. The electrification is on the overhead system, at 1,500 volts DC. The electrification has hastened the disappearance of much of the older rolling stock, and the passenger equipment of the Danish State Railways is now of a most up-to-date description. There are roughly 2,000 passenger and 650 other vehicles included in the coaching stock of the State system, while the private lines own about a thousand miscellaneous vehicles between them. All the more modem stock is of corridor lavatory types, kept, as is customary in all parts of Scandinavia, in a condition of scrupulous cleanliness. Passenger travel in the “general” class works out at about 1¼ miles for a penny at the present rate of exchange; small supplementary fares are charged for the use of trains which are described in the time-tables as “express”, and slightly higher supplements for the Lyntog services. Among the stations which have been rebuilt during recent years is the main station at Copenhagen, now an ornament to the city. Its long, low frontage of terra-cotta, picked out in white, and with a central turret over a graceful colonnade, fronts on the Tivoli Gardens, which form what is probably the best-known open space in the capital. The station building crosses the tracks, which here are below ground level, at right angles. Its principal feature is a magnificent hall, 550 ft long and 150 ft broad, almost ecclesiastical in the dignity of its appearance, with stained glass windows in both the ground floor and the clerestory. From this hall stairways lead down to the platforms. Trains arriving from the west - that is, from all parts of Jutland by way of the Little Belt Bridge, and from Germany by way of Warnemunde and Gjedser - are dealt with at Platforms I and II, and trains to this direction depart from Platforms III and IV. Traffic leaving for the north, which includes the through trains for Norway and Sweden by way of the Copenhagen-Malmo train-ferry, leaves Platform V, together with local electric trains for Klampenborg. Platform I deals with departures for Helsingor and the coast line, and Platform IV with arrivals from the same direction. In the north direction the exit from the station is through a tunnel which has been constructed by “cut-and-cover” methods under the Boulevard Norre Valdgade. The Danish State Railways are thus well in the van of railway progress in Europe at the present time, both as regards train service and equipment. AGAINST THE SKYLINE this modern Diesel-driven streamlined train makes a striking picture and represents the modernity of the Danish railways. The train illustrated has been tested to 87, but is limited normally to 75 miles an hour, and is capable of seating 160 passengers. It is one of three in operation between Copenhagen and the principal towns in Denmark. You can read more on “Electrification in Europe”, “Germany and Holland” and “Sweden’s Rail System” on this website.